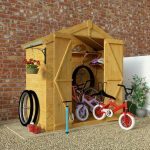 Pre built Shed - Who Sells The UK’s Best Pre Built Shed? A pre built shed can be the perfect solution for people who have busy lives, and who don’t want to spend those precious hours outside of work or family duties installing a garden building. Pre built sheds can also be an ideal choice for those who lack confidence in their DIY abilities, and those who are less mobile than they once were. That’s why an increasing number of sheds are now available with a professional installation service, meaning that you can sit back and wait for your new shed to be built for you. To help you find the model that’s best for you, WhatShed have created this handy pre built shed guide. For the purposes of this league table we’ve considered sheds with a maximum base area of 12 feet by 10 feet, thus discounting larger workshops. All models must have a pre build or pre installation option, and this has been included in the prices you’ll see below. 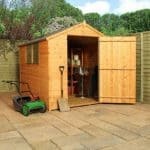 We’ve then looked at the overall value for money that each shed offers, as well as their design and appearance, build quality, and any value adding features such as extended warranties. We were then able to compile a list of the very best pre built shed that can be bought online in the UK today, along with fourteen high quality runners up. Whilst there aren’t as many pre built sheds available as we would like to see, considering the added convenience they bring, we were pleased to find fifteen exceptional models for our league table. In a very competitive category, it’s congratulations to the twelve foot by ten foot Champion heavy duty shed from Shed-Plus. 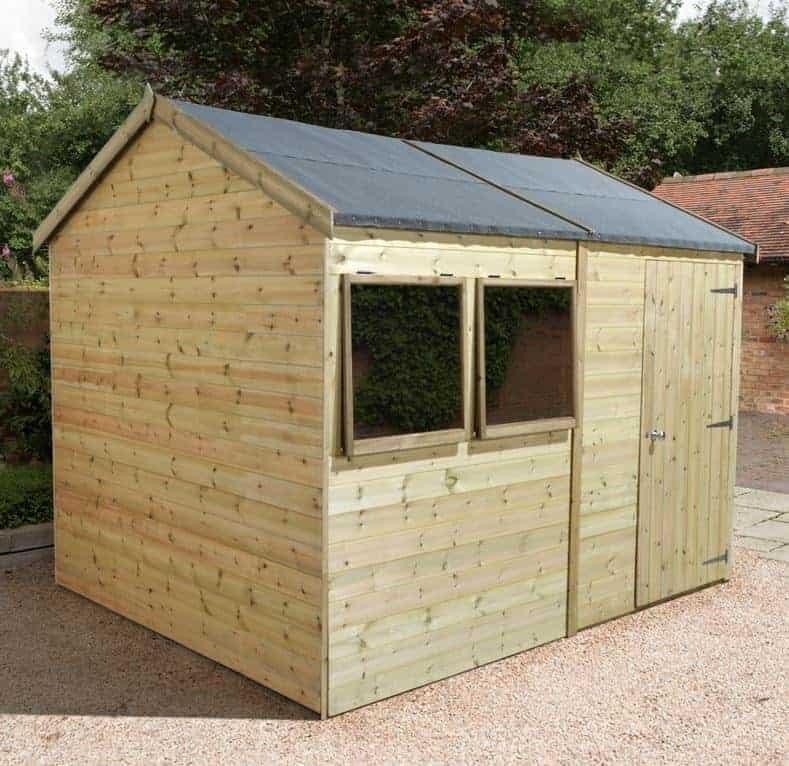 It’s large and durable with a long 15 year warranty period and a good value price too, making it our number one pre built shed that can be purchased online in the UK today. Whether you’re looking for apex or pent sheds, metal workshops, or anything in between, WhatShed bring you the in depth reviews that can answer all your questions. This really is a champion pre built shed in more than just name, which is why it finds itself taking a deserved place at the top of our league table. It’s the largest shed to feature in our top fifteen list, and so that makes the pre installation service that it comes with even more useful, saving the customer not only time but also money if they were planning on paying contractors to install their shed. It’s also very tough, and thanks to all of the timber being pressure treated it comes with the reassurance of a 15 year manufacturer’s warranty against rot. Taking all of these factors, and its classically styled good looks, into consideration it was a clear choice as our number one. We were impressed by just how stable this pre built shed will likely feel once its in its place in the garden, and that’s because it has a heavy duty 44 x 44mm frame which is significantly thicker than we often see on the timber sheds we review. On top of this is tough tongue and groove cladding, which in conjunction with the tall apex roof does a good job of keeping rain out. We were pleased to see that the two windows were equally strong and reliable, featuring shatter proof toughened glass, and that they open to allow easy ventilation. An eight foot by six foot pre built shed such as this can be the perfect solution for a small to medium sizes garden, as not only will you not have to worry about having to construct and install it, there’s enough room for a large selection of garden tools and equipment whilst it won’t take up too much room from the lawn itself. With an apex roof and shiplap style cladding it has a classic and attractive appearance that caught our eye from the moment we saw it. These features are also excellent at repelling rainwater of course, so you can be confident that the contents inside are kept dry. An initial dip treatment helps to protect the timbers from rot, and it bring with it a 10 year guarantee which we feel is more than reasonable at this price. 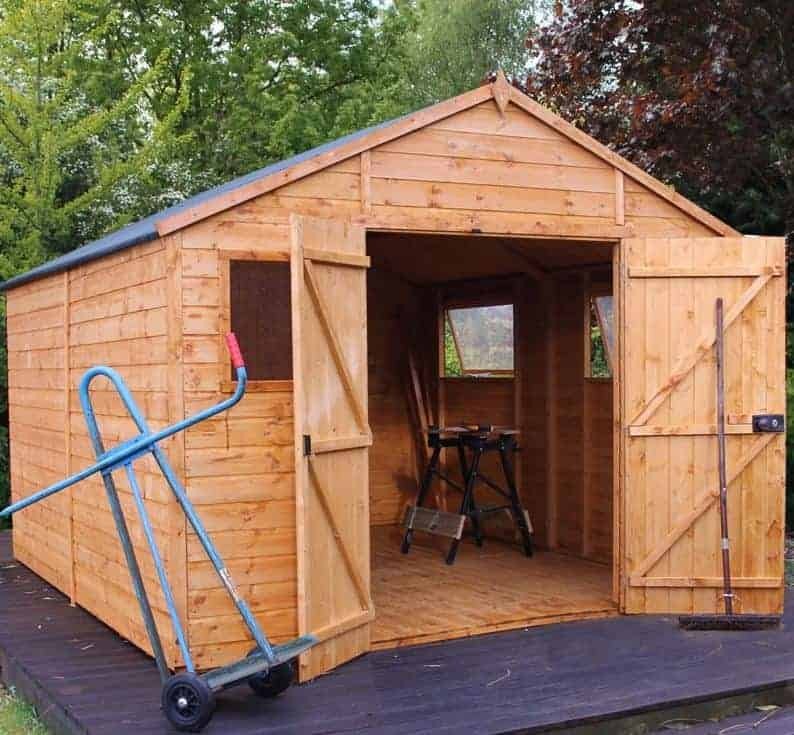 It’s the great value for money offered by this pre built shed that sees it gain the runners up spot in our WhatShed league table. We think the price tag of less than five hundred pounds for a mid sized timber shed with professional installation included is as good as anything that we’ve seen among similarly dimensioned garden buildings. We were also pleased to see that pressure treated floor joists were included that give long lasting protection against the threat of ground moisture. Just because a garden building is on the compact side doesn’t mean that a pre build service can’t prove invaluable. There are many people who for one reason or another can’t install a shed of any size themselves, and so we were glad to see a pre built shed available in smaller as well as large sizes. 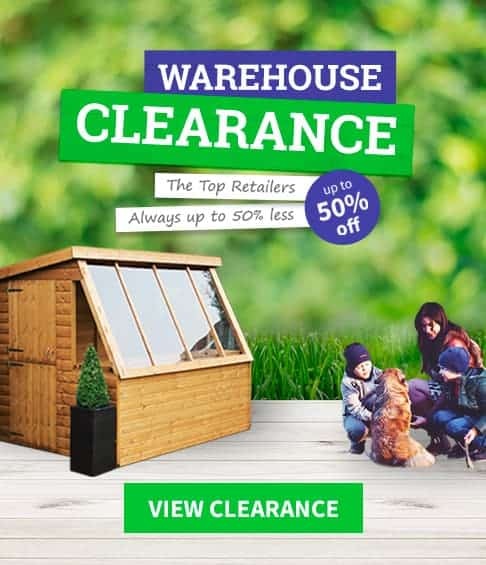 With a base width of 1.22m and a base depth of 0.89m this is a perfect choice for those who can benefit from the storage facilities offered by a high quality shed, and yet don’t have much space to spare in their garden. It’s also the cheapest pre built shed in our league table by some distance, which helps it gain a position inside our top three. We were pleased to find that despite its compact nature, the manufacturer had cut no corners when it came to the quality of components used. Shiplap interlocking cladding is used for the walls, which isn’t something we would necessarily expect to see in a pre built shed of this size and this price. It means that the shed should prove to be both strong and durable, especially as the timbers have been pressure treated and come with a 15 year guarantee. Another feature we feel can prove very useful is the lack of windows; this means that passers by will be unable to see if anything valuable is kept inside, making it less likely to be targeted by opportune thieves. This is the first metal pre built shed to feature in our top fifteen list, and as such it holds many advantages over the pre built wooden sheds that dominate this top fifteen league table. Being made of metal it won’t rot and isn’t prone to attack by insects or rodent. It also doesn’t require any painting, and so is even more convenient for those who want a no fuss garden storage solution. It’s these qualities that help this Greenvale shed earn a place inside our top five, as well as the excellent value for money it offers for what is a well proportioned garden building. This pre built shed has base dimensions of 3.13 x 2.42m, and the apex roof above it rises to a peak height of 1.98m. This isn’t the tallest then of the sheds in our league table, but there’s still lots of room available for storage purposes. If you’re worried about having something too metallic looking in your garden then don’t be, as we found the green and cream colour scheme of this model pleasing on the eye. At a price of less than seven hundred pounds, fully assembled, with a 10 year guarantee as well, we feel this represents very good value for money. Most of the sheds in this top fifteen league table feature a standard apex design, but this takes advantage of a reverse apex. It means that it’s wider than it is deep, which makes it a good choice for gardens that are on the shallow side. This is shown by its base dimensions of 3.66m x 3.05m. It was its sheer size, along with its smart reverse apex design, that first caught our eye. 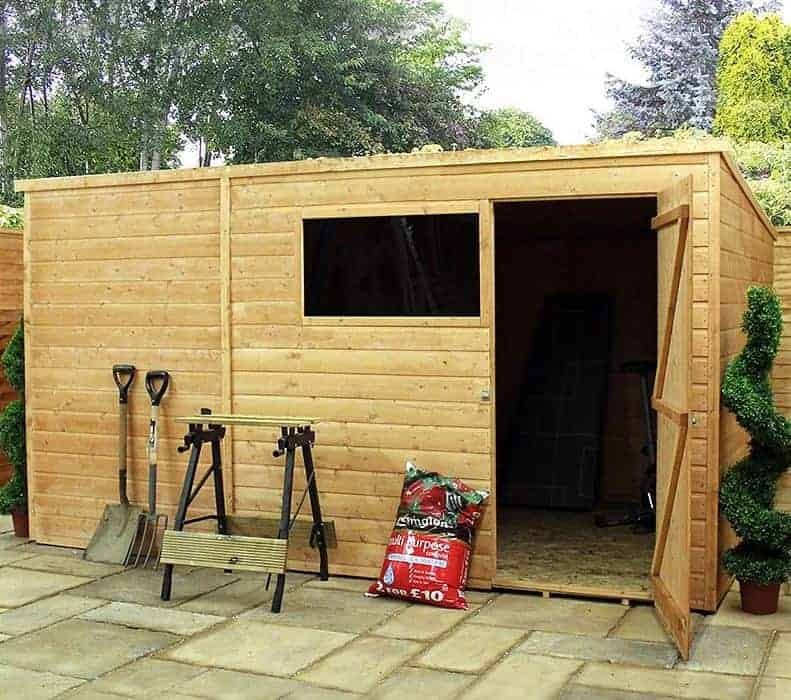 Being so large gives it extra versatility, as we can easily imagine it being used not only as a very accommodating storage or garden shed, but also as a workshop for either business or crafting purposes. The reverse apex roof itself is very tall, with a peak height of 2.70m and an eaves height of 1.96m. 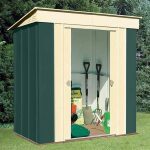 This makes it as tall and welcoming as any wooden pre built shed we’ve reviewed, and should provide a comfortable environment to move around in. It’s not the cheapest shed in our league table, but it does have the added value, not to say added peace of mind, of a 15 year warranty thanks to its long lasting initial pressure treatment, and we were pleased to find that it has the extra strength and reliability that comes from a thick, heavy duty frame. This is the first pre built shed with a pent roof to make it into our league table, and it gains a position inside the top half by offering a great value price combined with the high build quality that we always like to see in garden buildings. Wooden pent sheds are among the most traditional looking garden buildings, and we know it’s a style that many shed lovers appreciate. It also brings the advantage that they can be hidden away behind garden walls or fences if required, without an apex roof to stick obtrusively out. We were pleased to see that tongue and groove cladding had been used for the walls, which is covered by a 10 year manufacturer’s warranty against rot. This is why the shed will feel so strong and sturdy once it has been delivered and installed. There’s a solid sheet roof and floor, but we commonly see these materials used on a pre built shed that’s as affordable as this one. 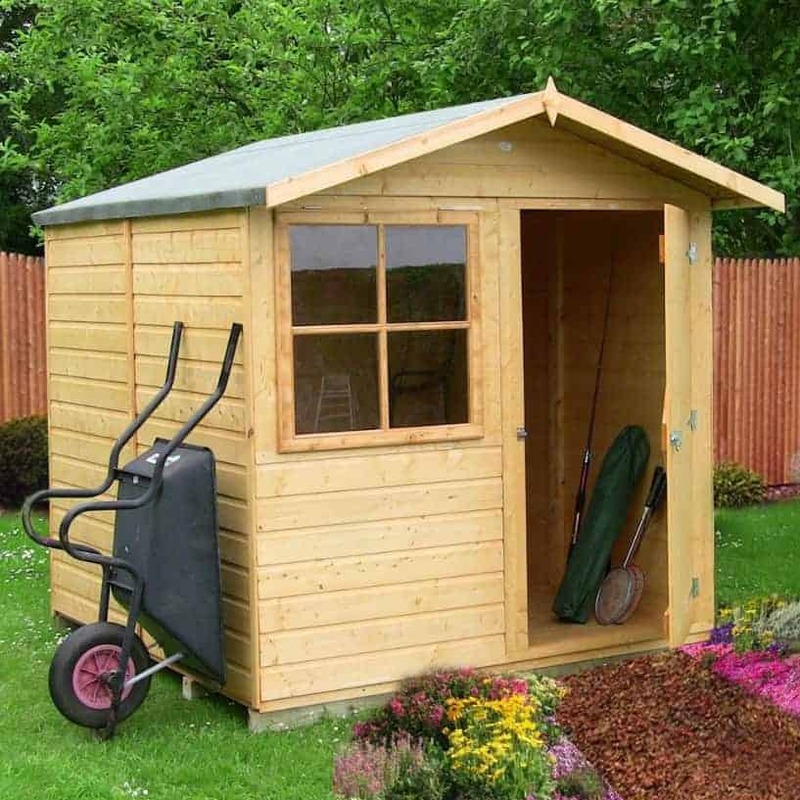 The eight foot by six foot size is easily enough to fit a lawn mower inside with space to spare for tools and equipment, and there’s also a fixed rectangular window so you can pass time inside the shed as you look out at the garden. 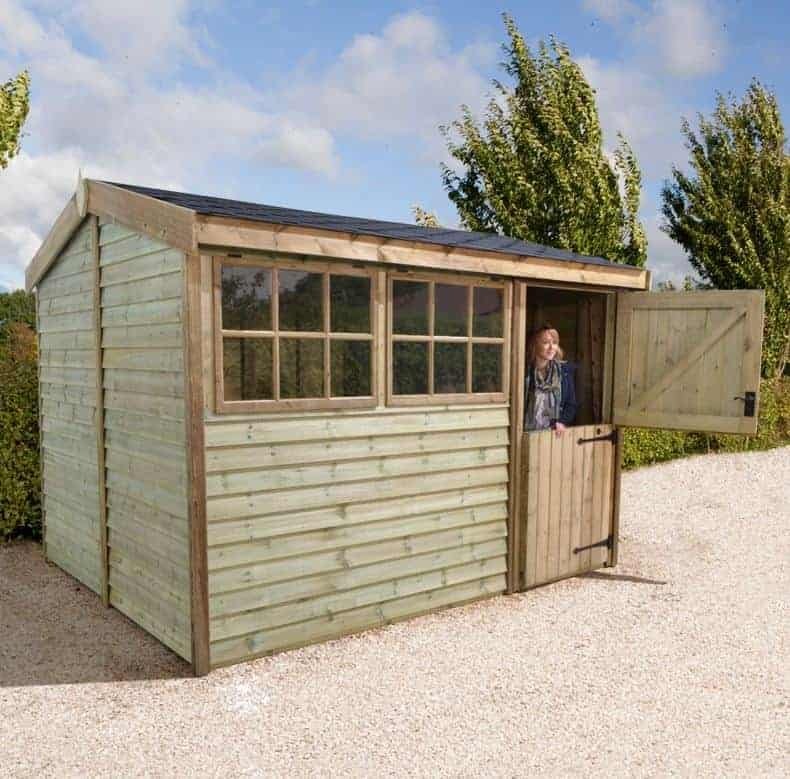 This is the second pre built shed to be made out of metal in our WhatShed league table, and if anything it’s even more attractive than the first although its smaller capacity for a similar price tag accounts for its lower placing. The brown colour scheme, with a darker brown used for the roof and detailing, really caught our eye from the moment we saw it. From a distance it could almost be a timber substrate, and even up close the woodgrain effect is very attractive. 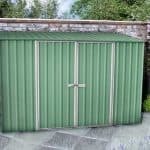 This, then, is an ideal metal shed for those who normally prefer the look of traditional wooden garden buildings. 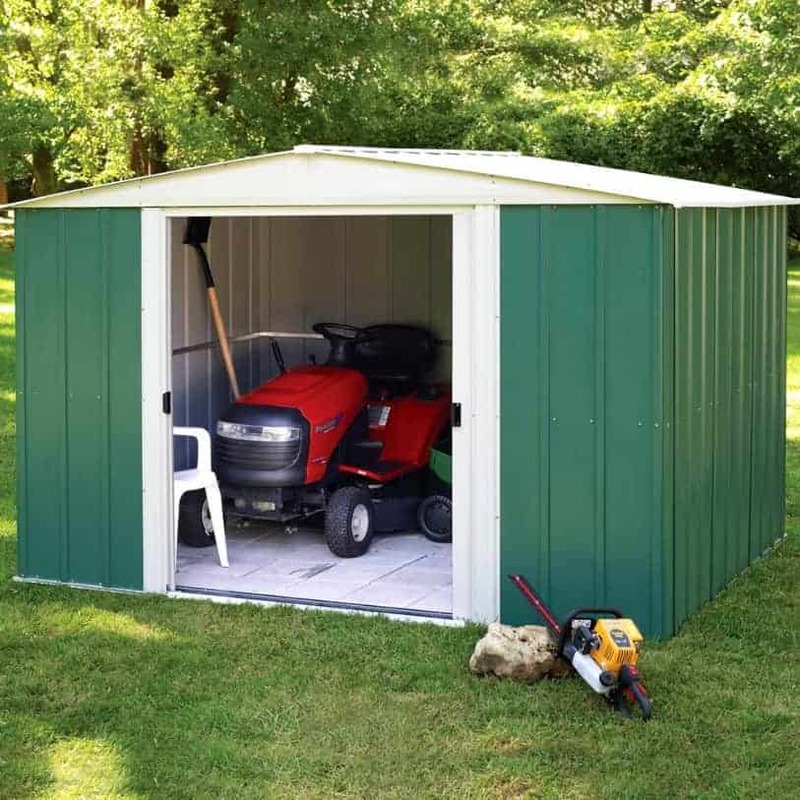 Metal sheds are lighter and therefore easier to handle than wooden sheds, and yet they can also have sharp edges that can make assembling them seem a daunting prospect. 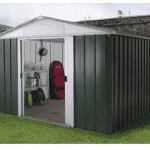 That’s why a metal pre built shed such as this one can be such an attractive proposition. Being made of painted galvanised steel it feels very strong and stable, and we wouldn’t be surprised to see it last much longer than the ten year warranty period provided by the manufacturer. For a ten foot by six foot metal shed, with wide opening double doors for easy access, this once again is a good value for money purchase. 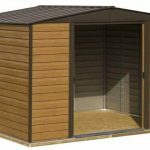 We have another heavy duty, well constructed, and durable pre built shed next in our league table, and it’s also its relatively expensive price when compared to its twelve feet by eight feet dimensions that prevent it from gaining a place in the top half. If toughness is one of the attributes you prize most highly in a pre built shed then this is certainly one to add to your shortlist, and yet it looks very aesthetically pleasing too thanks to the high quality timbers used and the classic design of an apex roof with diamond finials. Once the professional installation has been completed, this shed should feel very sturdy and this is because of two factors: the strong tongue and groove cladding, and a much thicker than average frame. This winning combination makes this shed a good choice for gardens that are open to the elements and that are often exposed to high winds. It was also good to see that toughened glass had been used for the two opening windows, and this could come in especially useful if you are likely to have children playing in the shed’s vicinity. 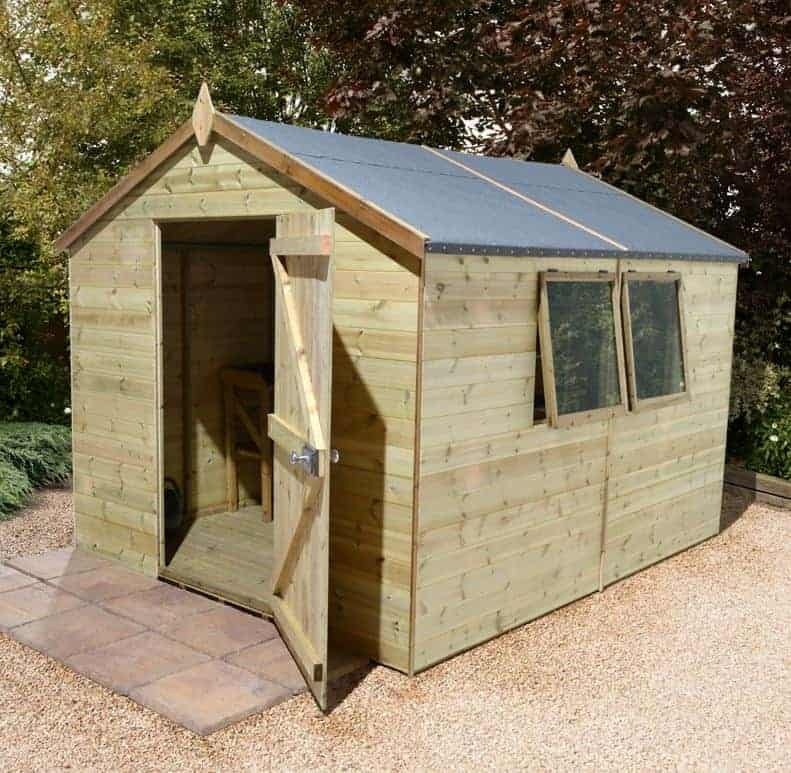 With pressure treatment used on all the timbers, and a 15 year guarantee against rot as well, this is a large pre built shed with a lot to recommend it. This is the largest pre built shed with a pent roof in our top fifteen league table, with dimensions of 3.03 x 1.85m, but of course thanks to the professional installation service included in the price above you won’t have to worry about how long it’s going to take you to assemble it. Pent sheds are typically significantly shorter than their equivalent apex sheds, but that wasn’t as noticeable on this occasion, with the pent roof having a peak height of 2.05m. This means that the inside should feel roomy and more spacious, although you may still have to bend down a little when entering or exiting through the single door. The initial dip preservative treatment used by the manufacturer isn’t as effective as the pressure treatment that we always prefer to see, but it still means that the customer gets a 10 year anti-rot guarantee as long as they keep up the annual re-treatment schedule. This is as we’d expect with a pre built shed that’s as affordably priced as this one, as is the use of solid sheet material for the roof and the floor, although we were pleased to see that high quality tongue and groove cladding had been used for the walls. 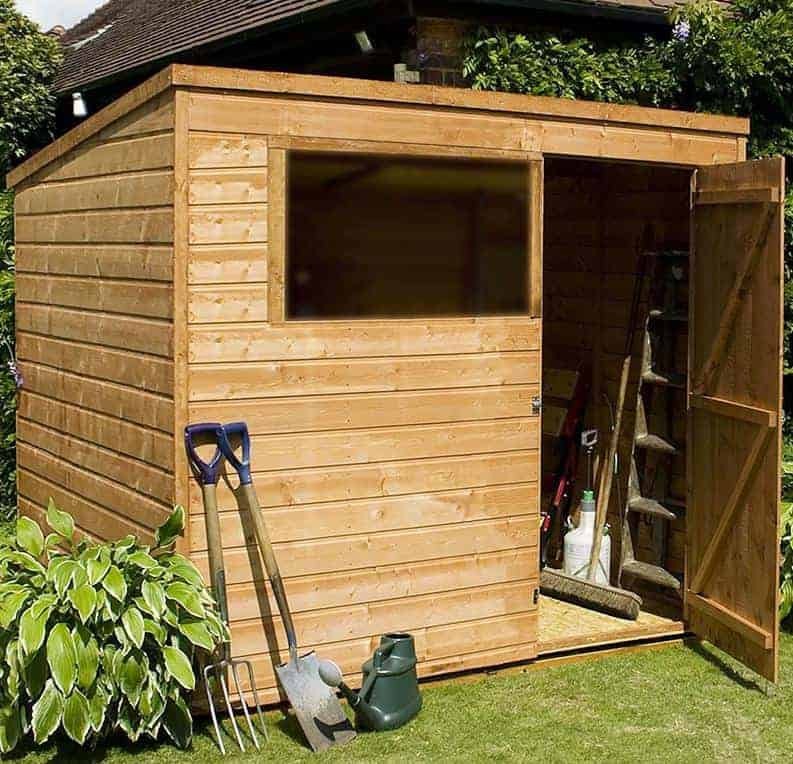 This is a large pre built shed that’s designed to be tough and durable, and it certainly succeeds in those aims. It’s also one of the most aesthetically pleasing wooden sheds that we’ve seen, however, thanks to its classic good looks and a smooth planed shiplap exterior. This has a touch of class about it, and we were pleased to find that all of the timber used in the building has been FSC certified to show that it comes from a sustainable source. The wood has also been dip treated, and although this means that it will need annual retreatments to keep rot at bay, it does come with the reassurance of a ten year guarantee. 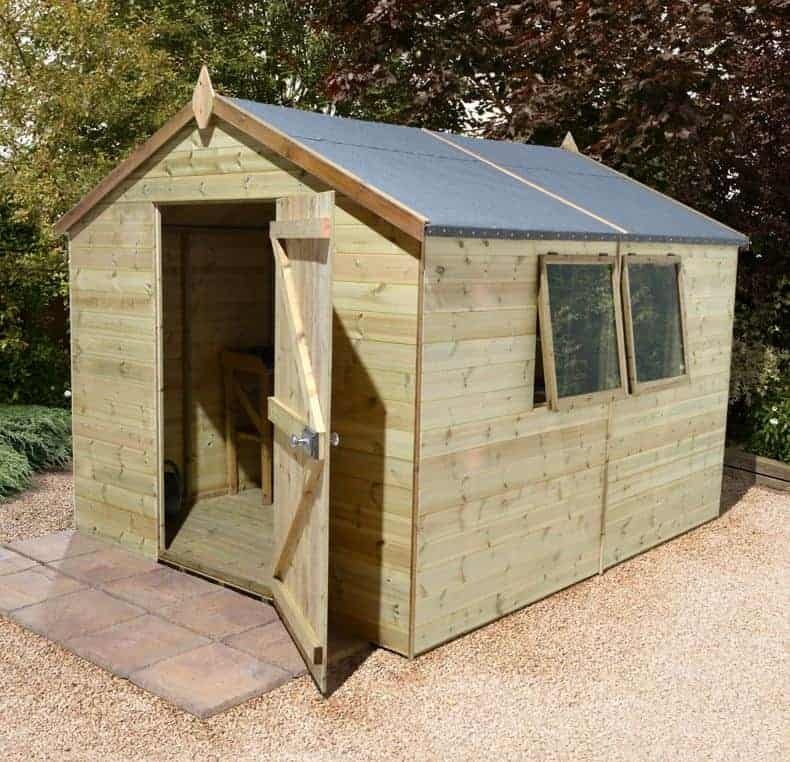 That makes this even better value, as we wouldn’t have been surprised to see a ten foot by eight foot pre built shed such as this to cost more than a thousand pounds, rather than significantly less. There are four windows, so this could easily be used as a home office or small scale workshop, and we were also glad to see that the double doors had been Z braced to give them extra strength and durability. It’s easy to add a padlock as well, so this can be a cost effective and good looking secure facility for your garden. 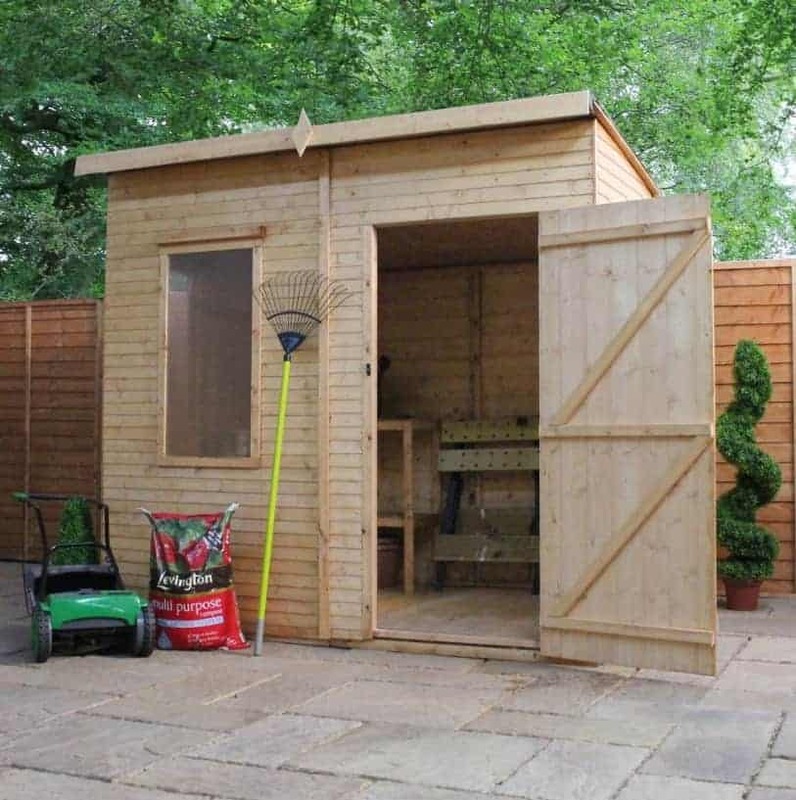 This timber constructed pre built shed has a look unlike any other in our top fifteen league table, and it’s one that we found highly attractive. That’s just one of the reasons that it gains a place among the very best pre installed sheds, although the relatively high asking price for an eight foot by six foot shed prevents if from climbing higher up the table. This takes the basic idea of a pent shed and adds a very stylish twist, in that the roof is curved rather than having a straight pitch. It still does a great job of channelling rain water away, as does the tightly interlocking cladding on the walls below, but it’s also sure to catch the eye and transform your garden shed into a garden feature. It’s the original looks that make this pre built shed stand out from its competitors, but we were pleased to see that didn’t mean that the manufacturer had taken any shortcuts when it came to the quality of components used. Tongue and groove shiplap cladding of 12mm thickness is used throughout, creating a shed that’s both strong and stable, and its 10 year guarantee provides reassurance that it should hang on to its good looks for many years to come. This is the cheapest of the three sheds in our league table to have base dimensions of approximately twelve foot by ten foot. It is also the lowest placed out of this large timber trio, however, as it is the only one to have a dip treatment rather than a pressure treatment, and the only one to come with a 10 year rather than 15 year warranty. It’s this that accounts for its relatively low placing, although it still has a lot of features that we feel mark it out as a shed of the highest quality. We were glad to see that tongue and groove cladding had been used across all the wooden surfaces of the shed, including the roof and the floor, which isn’t always the case with a dip treated pre-built shed that’s been designed with affordability in mind. We were also please to see the inclusion of a key operated locking system as standard, a security feature that is even more vital when you consider that there are two opening and two fixed windows. This means that the shed is full of natural light on a sunny day, which is why we feel it would make a great choice as a cost effective garden workshop. 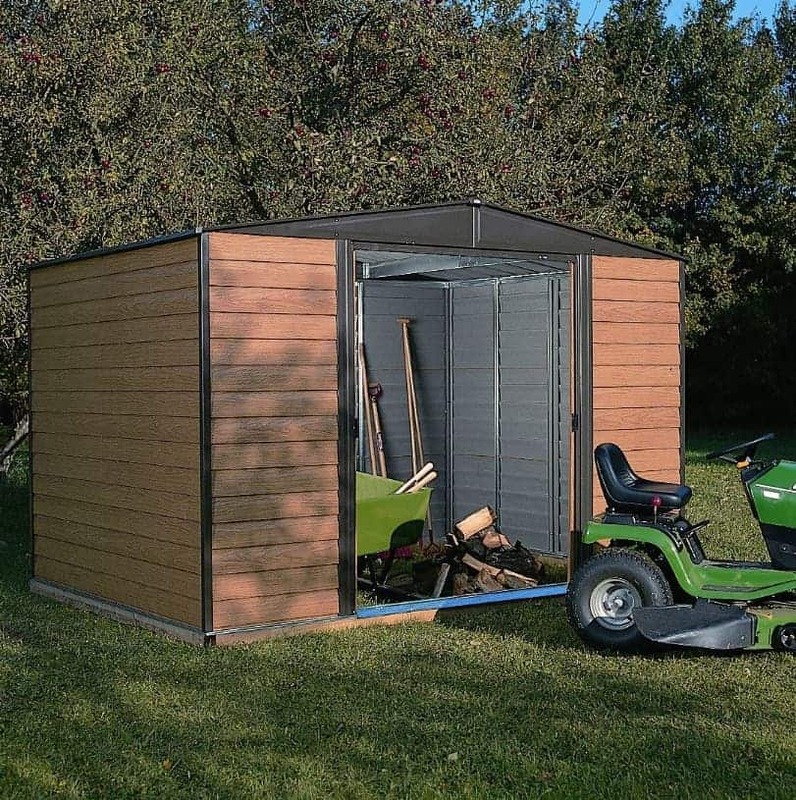 This mid sized pre built shed may not be large enough to use as a workshop, as some of the sheds in our top fifteen league table are, but it’s an ideal storage space for garden tools or for a lawn mower or bicycles. One reason that it’s such a good store for wider or bulkier items such as these is that it has wide opening double doors. They have a height of 1.72m and a width of 1.06m, which is more generous than we usually see on timber sheds of a similar size, and we were glad to see that they were braced to give them extra strength. Strength and security is one of the keywords of this shed, as it also includes a key operated lock not only on the double doors but also on the two opening windows. This can act as an effective deterrent against potential shed thieves, and as all the windows, including the fixed position one, are made of styrene they are also shatter resistant and therefore hard to break into. We found a lot to like about this apex roofed shed, and it would have been placed much higher up our league table if the asking price had been a little lower and if it had come with a 15 year warranty rather than the 10 year one supplied by the manufacturer. 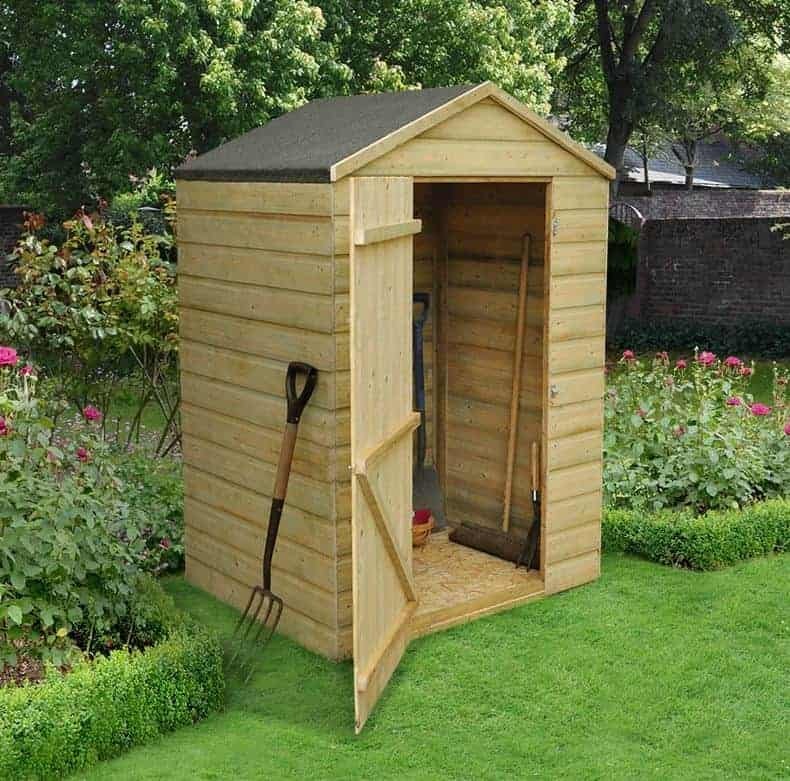 This is a very neat looking wooden pre-built shed, and its seven foot by seven foot base size makes it an almost ideal choice for smaller gardens that still require a well sized storage facility. There’s enough room inside for a lawn mower alongside garden tools and equipment, and we can easily imagine bicycles being stored inside too. Even so, it won’t take away too much precious space from the lawn. 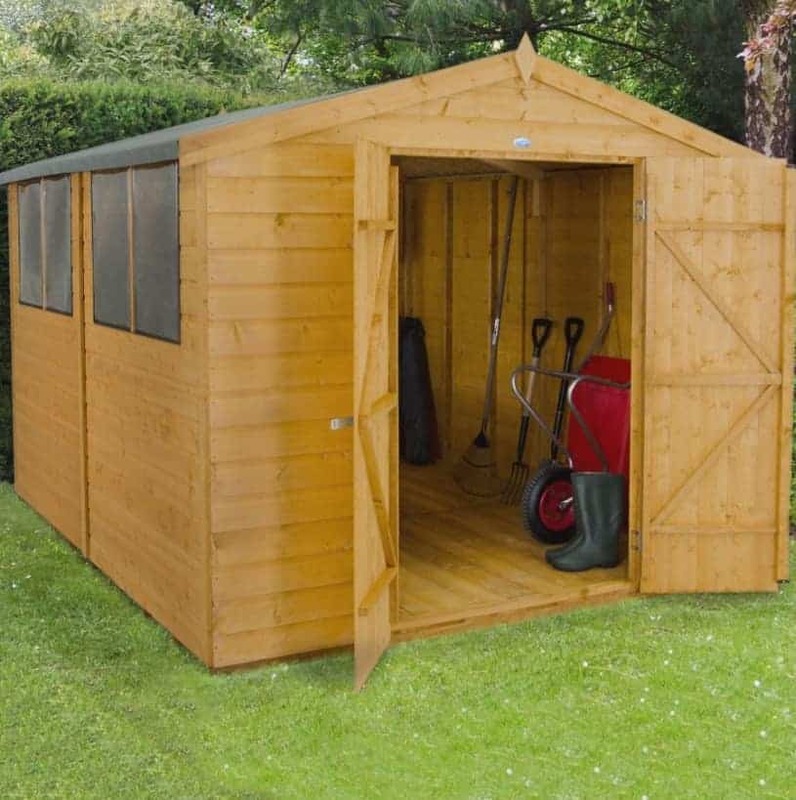 This is one of the taller mid sized wooden sheds that we’ve reviewed, with the apex roof having a ridge height of 2.10m, which is especially useful if you want to store taller items inside, or if you’re quite tall yourself. What we liked most about the roof, however,is that it has a significant overhang at the front. 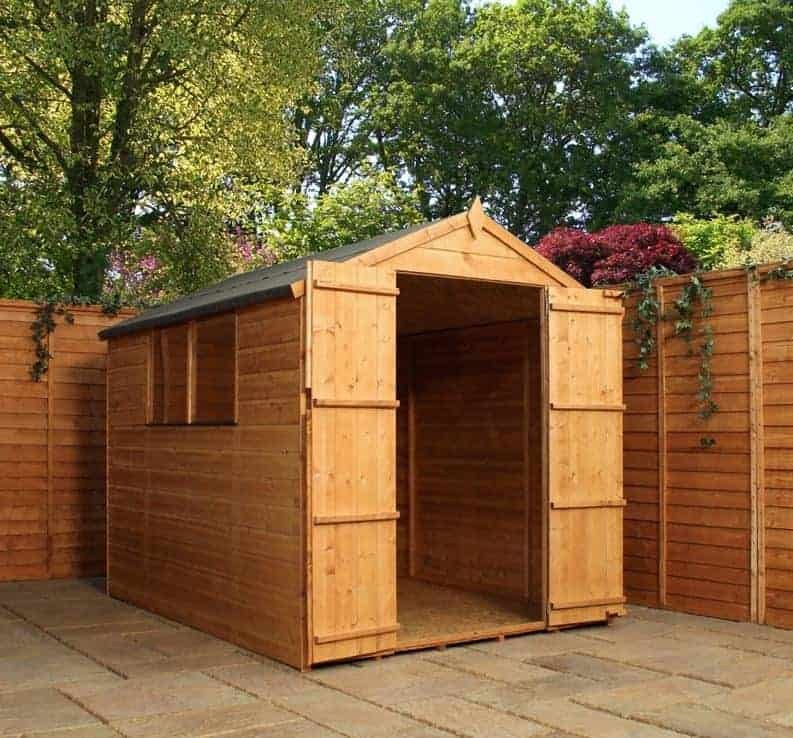 This is a feature that we rarely find on a pre built shed, and yet it can prove very useful as it means that there’s a shaded area outside of the entrance on a sunny day, as well as extra shelter when it rains. We also liked the square Georgian style window, especially as it can be opened to allow a supply of fresh air in. 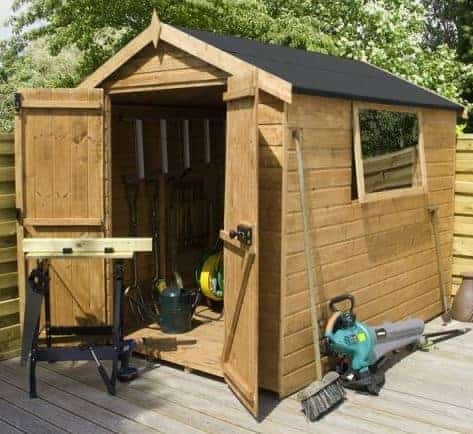 This is a well built and well priced shed, and it’s only the lack of any extended warranty period that sees it fill the penultimate spot in our league table. This is the most attractive pre built shed we’ve reviewed, with a unique design that caught our eye upon first sight. It’s also very tough and durable, with a long 15 year warranty against rot. It’s also, however, by far the most expensive shed in our league table of the fifteen best pre built sheds that can be bought online in the UK today, and this accounts for its position at the foot of our table. If you have a budget that stretches to over twenty three hundred pounds, you may want to give this one a look. There are three factors that contribute to the original look of this ten foot by six foot pre built shed that we liked so much. Firstly, it has a reverse apex orientation. Secondly it has two large windows with Georgian style cross hatching that dominate the front of the building. Finally, it has a stable style door, meaning the the upper half can be opened for extra ventilation while the bottom half stays closed. We also liked the use of rebated featheredge cladding, which at 16mm thick is thicker than that used on any other pre built shed in our list. The floor was also noticeably thicker than usual at 19mm, making it ideal if you want to place heavy machinery or furniture inside. This may have a high price tag, but it’s a very high quality shed.